This respiratory protective device is designed for self-rescue during emergency situations infused with hazardous fumes and gases. 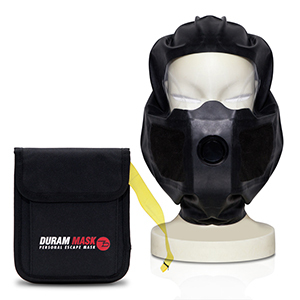 The CHEMBAYO mask provides users with short-term respiratory protection against low concentration of chemical or biological agents, emphasizing protecting from nerve and blood agents, combined with HEPA filtration capabilities. Jim Smith's background as a tactical firearms instructor spans more than two decades. Jim has trained and served with the most elite units in the U.S. Miltary in various theaters around the world. Chembayo mask combine small size and weight for easy access, functional design for easy use with a high efficiency multi-layer filter, elastic hood and large visor for maximum protection in an instant. In the future we want to bring you our shop with red dot sight installations on a variety of pistol platforms. Not limited to that, we are also planning to texture polymer frames and install safety systems. We are working very hard on our site, shop and business. But we need time for relaxation.